I am thinking of adding some sashing to make it a bit bigger. Maybe a border too but I don't know if that will be too much. I'm off to try some hand stitching. If you haven't stitched your blocks together yet, you can still add a fourth round of steps. And I really like a border or two as they dray the eye toward center. Have fun with this - it's pretty. 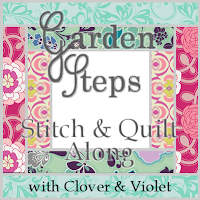 Your Garden Steps quilt is looking great! I know this isn't terribly helpful, but I think it will look good no matter what you decide!